The last (and first) time I cooked the Christmas Day dinner was back in 2012. Then, I used Nigella’s Christmas turkey recipe. It turned out OK (there was nothing wrong with it), but Christmas itself was a bit of a sad affair – everybody in the house was ill for various reasons, I had a 4-month old baby, and needless to say, ended up eating my Christmas dinner cold. Turns out, flattery will get you everywhere. So, umm, yes, apparently. I defrosted the turkey in the fridge 5 days before Christmas, then on the 23rd I put the brine together and placed the turkey in it, before finding a very cold spot (in a locked outdoor shed) to let it soak up all the flavour. The brine contained a myriad of spices and flavouring, including orange, cinnamon, cloves, mustard seed, fennel seed, nutmeg, garlic, onion… basically anything with a vague hint of Christmas flavouring that you can think of. This was a great job for a 2-year old as well; he loved tipping all the measured out ingredients into the bucket of water. Although he was less keen to touch the turkey itself! On Christmas Day morning, I stuffed the turkey with my sage and onion stuffing, and then basted it with a mixture of melted butter and maple syrup. It took 2 1/2 hours to cook; the first 30 mins or so at 180C, and the next two hours at 160C. That meant it got taken out of the oven at midday, an hour before the rest of our dinner was ready. This worked out well, as it meant that there was space in the oven for everything else, and the meat got to rest, but was kept nice and warm, with a layer of tin foil over the top of it. The end result was pretty good, and I was fairly pleased with myself for getting the timings and the flavourings right. Definitely more of a success than my 2012 effort! So, almost immediately after Halloween comes Bonfire Night in the UK (5th November). So obviously you need a cake for this occasion too! The cake in question this time around was this bonfire cake (which, finally, I have a photo of)! I’ve made it a couple of times before, and it always proves to be pretty popular. The cake itself is ginger, but you add a chocolate buttercream and then cover it in matchmaker sticks and colourful sweets (in my case Smarties, because that’s what I like) to make it look like a bonfire. We actually used mint matchmakers this year because that’s what we had lying around, but the ginger does taste better with the orange ones. The recipe also suggests that you add sparklers and light them for a proper bonfire effect, but as we would have had to find time to go to a proper fireworks store to source this, we decided not to bother. It still tasted good, even if it didn’t look quite so pretty! I’ve made this before, but not for some time (it was back in 2010 in fact, about 4 years ago now). So when Dan requested “some sort of orange cake” for his birthday this seemed like a good idea. I knew it tasted pretty good, and was also relatively easy to make. 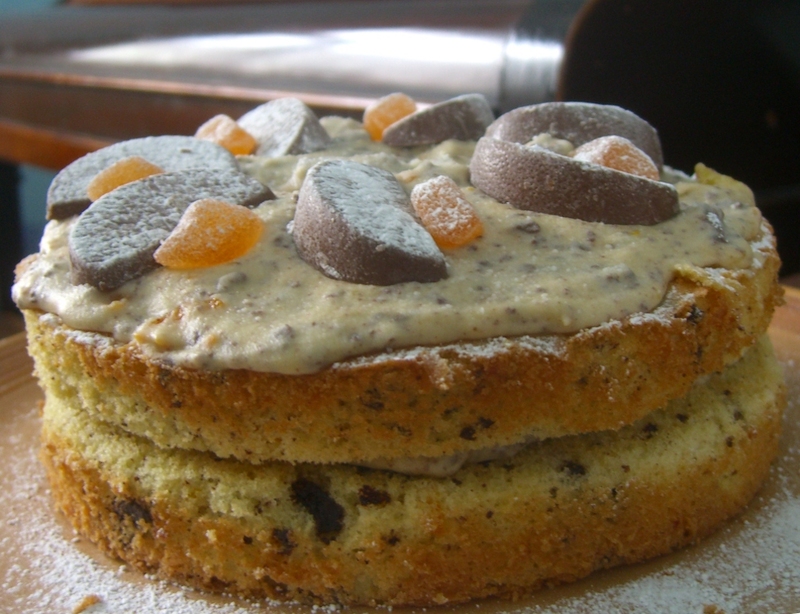 The cake itself is just a basic sponge cake with orange zest and chocolate flavoured orange added to it. 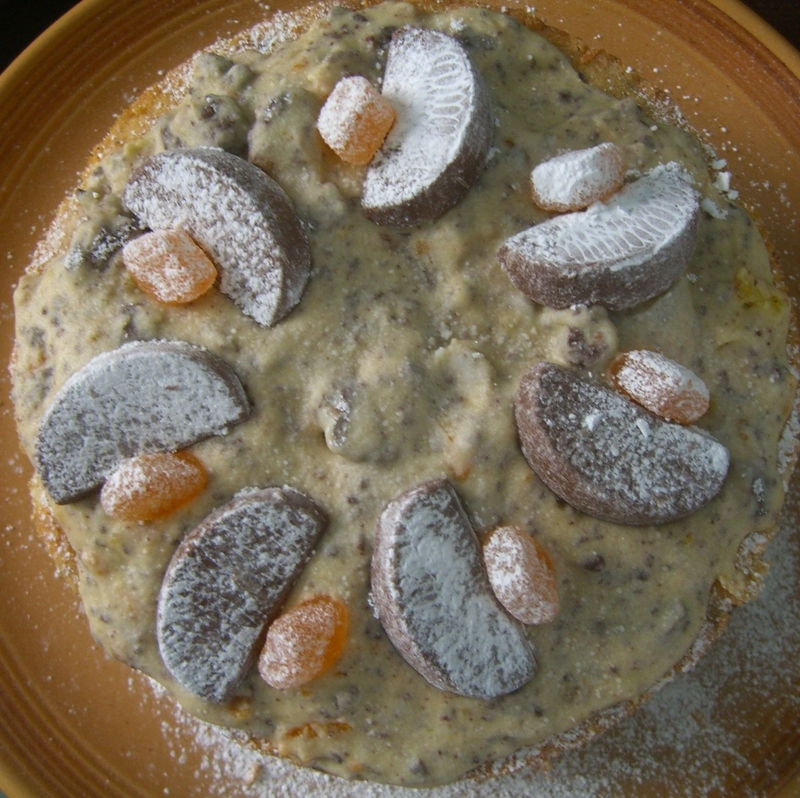 The topping is just buttercream, but with orange zest, orange juice and chocolate orange flavoured chunks added to it. What makes the whole thing look so impressive is that you put chocolate orange slices on the top, along with some orange jelly sweets (and in my case, some lemon ones as well because I ran out of orange). The whole thing probably took about 30-40 minutes to make, and got eaten rather quickly. To add to the joy, I added a photo of it to Facebook and got some very positive comments. Mostly along the lines of “I want one”, but hey, at least it looked good! This simple fruity “cake club” recipe was well received, and it is very flavour-filled when fresh. When a little older it loses its charm a little so eat it up! I think it comes recommended by our expert tasters, although you’d be advised to reduce the amount of orange zest as I found it left a tang for quite a while afterwards! I didn’t put the sugar in early enough and it didn’t melt into the mixture but sat on top. This was OK but I think a crispy sugary layer would’ve been better! I adapted the recipe from a 12x9in recipe, hence the odd amounts. the apricot was my own addition as I rather like the subtle flavour it gives the cake when you get a piece. I found the sultanas sunk a bit – to fix this, you can try sprinkling half of them on top instead of mixing them in. Recipe: Mary Berry’s Ultimate Cake Book, page 79. 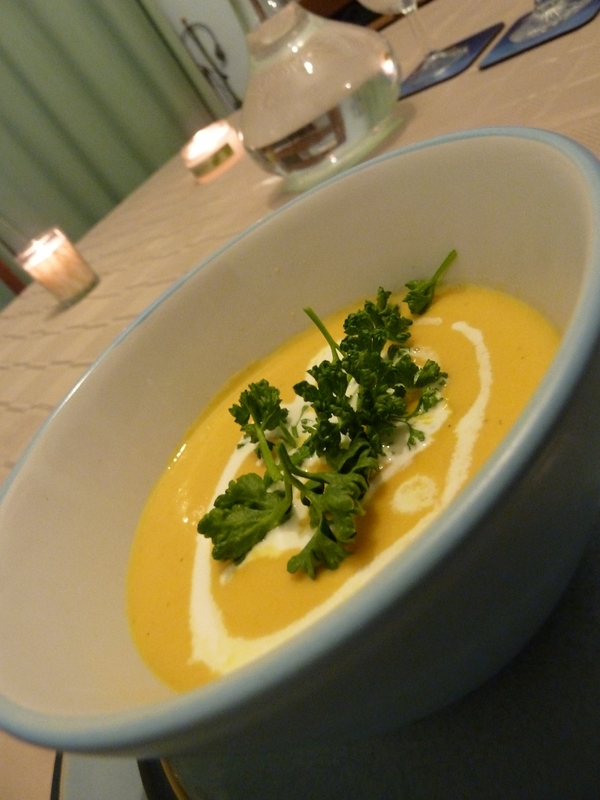 Parsnip soup is always a good thing, but I really liked the creaminess and orange twang from this recipe. There are two surprising flavours in here – orange, and ginger. The soup is otherwise a fairly standard affair – stock and cream and vegetables all blended together – but it does taste quite distinctive and in a good way. We would have this again. Melt a knob of butter and fry half a chopped onion with a clove of garlic until lightly browned. Add 200g chopped carrots and 1 large parsnip and saute until softened. Add 1/2 tsp ground ginger 1-2 tsp on freshly grated orange rind, and 300ml of vegetable stock. Bring to the boil and simmer for 30 minutes until all the vegetables are tender. Blend in a food processor until smooth, then return to the saucepan, reheat and mix in 60ml of double cream. Who made it: A joint effort. Recipe: The Daily Cookbook by Love Food, February 22nd. 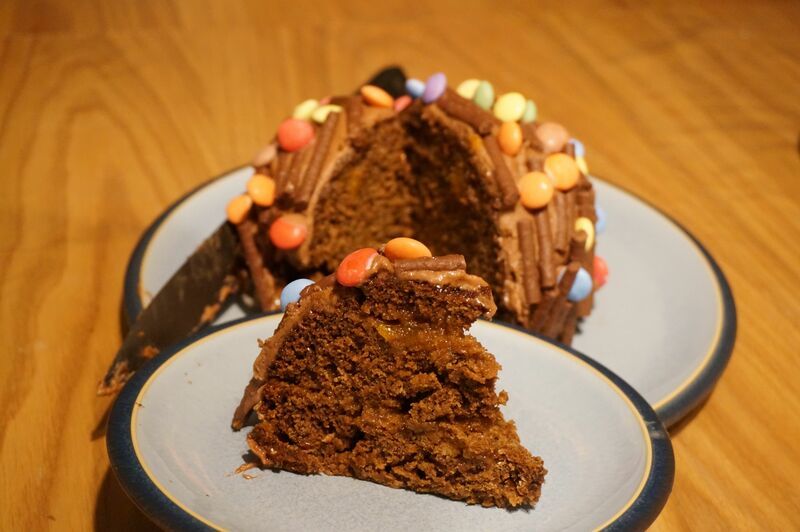 This cake is very chocolaty, very orangey, and very sweet. Perhaps not to everyone’s taste, it is neverless going to be a hit for those with a sweet tooth. We took this cake on the barge holiday, where it competed with Francis’ cake which was much larger and less sweet. It was just a little too sweet for me, which meant that small slices were what you wanted – lucky, as we were sharing between a lot of people! Recipe: Hallelujah Chocolate! by The Chocolate Squad, page 17.